Dried plums, or prunes, aren't just for those whose digestive tracts are feeling a little backed up. These nutrient-rich fruits also provide a number of other potential health benefits due to the nutrients they contain, possibly lowering your risk for heart disease, osteoporosis, Type 2 diabetes and obesity, according to an article published in "Critical Reviews in Food Science and Nutrition" in 2013. 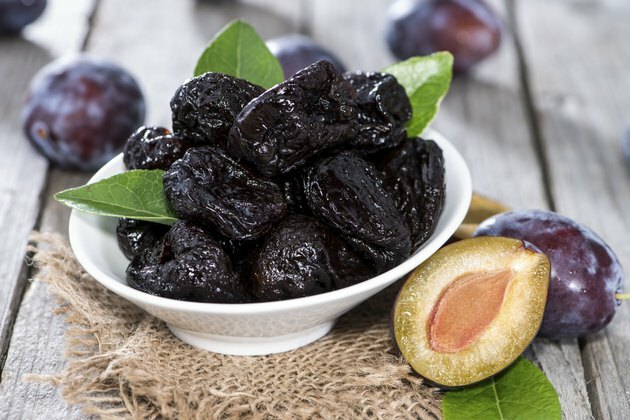 Eating a one-quarter-cup serving of prunes, or about four prunes, provide you with 12 percent of the daily value for fiber, 32 percent of the DV for vitamin K and 9 percent of the DV for potassium. Fiber helps lower cholesterol, and thus your heart disease risk, and increases feelings of fullness, keeping your digestive tract running smoothly so you are less likely to have constipation or other digestive issues. You need vitamin K for building strong bones and clotting blood, and you need potassium for keeping your nerves and muscles working properly, and limiting increases in blood pressure from consuming too much sodium. Consuming three to six prunes per day may help you lower your blood pressure, according to a study published in the "Journal of Ayub Medical College" in 2010. Eating prunes may also help minimize the oxidation of your low-density lipoprotein, or bad cholesterol, which helps limit inflammation in your body and lower your risk for heart disease, according to an article published in "Critical Reviews in Food Science and Nutrition" in 2001. If you want to limit your risk for osteoporosis, you may want to start eating more prunes. This fruit may be the most beneficial to eat in terms of lowering osteoporosis risk, according to a study published in "The British Journal of Nutrition" in September 2011. Prunes improved bone mineral density more than dried apples in this study, at least in part by limiting bone turnover. An article published in "Ageing Research Reviews" in April 2009 noted that prune consumption appears to not only slow bone loss, but also reverses some types of bone mineral density loss. Although prunes, like all dried fruits, are calorie dense and high in sugars, they can be enjoyed in moderation by both people on weight-loss diets and diabetics due to their unique composition. People who ate dried prunes before their meals felt fuller and ate less at their meal than those who got a similar amount of calories from bread before their meals in a study published in "Eating Behaviors" in August 2010. Since prunes contain high amounts of fiber, sorbitol and fructose, they don't cause blood sugar levels or insulin levels to spike after you eat them, making them one of the better dried fruit options for diabetics. However, you do still need to take into account their calorie and carbohydrate content, with each prune providing 24 calories and 5.7 grams of net carbs. Critical Reviews in Food Science and Nutrition: Chemical Composition and Potential Health Effects of Prunes: A Functional Food? Which Fruit is Good for Constipation?